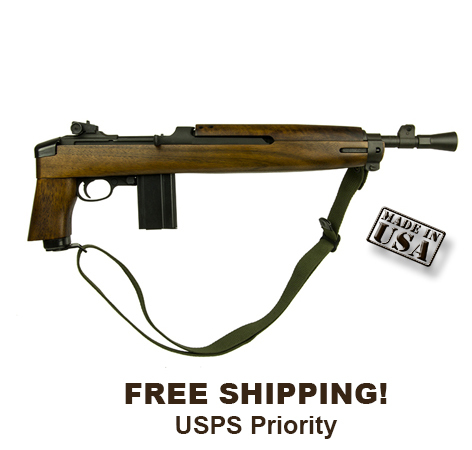 The M1 Carbine Pistol, the "Advisor", features many of the same characteristics of the original Inland Carbines and are manufactured in the USA! The “Advisor” M1 pistol is modeled after the modified M1 carbines that was a popular conversion made by US Military Advisors during the Vietnam Era. These “Military Advisors” found that the compact and reliable M1 carbine could be made even more suitable for their specific missions by cutting the barrels down to pistol lengths and utilizing either a cut down standard stock or the M1A1 folding stock, the folder was the stock of choice if they could get their hands on one. These modified M1 carbines were favored by the US Military Advisors as well as the Tunnel Rats tasked with clearing the matrix of tunnels and engaging in extreme close quarters. The new for 2016 Inland Advisor, weighing in at 4.5 lb, is chambered in .30 carbine, features a 12” barrel with type 2 barrel band, adjustable rear sights, push button safety, round bolt, and a“low wood” walnut stock modified M1A1 stock minus the wire portion of the stock making the “Advisor” a legal pistol. The Advisor includes a 15 round magazine and utilizes a 30 rd mag catch to allow high capacity magazines. The barrel flash hider is a conical flashider and is threaded ½” x 28 tpi allowing the use of your favorite accessories with the same threads! The modifications to the M1A1 Stock does allow for the re-attachment of the wire portion of the stock, however NFA rules do apply.